The above video on the Purple Line Extension project is the third that Metro has recently rolled out highlighting key Metro construction projects. The other two videos look at the Crenshaw/LAX Line and the Regional Connector. 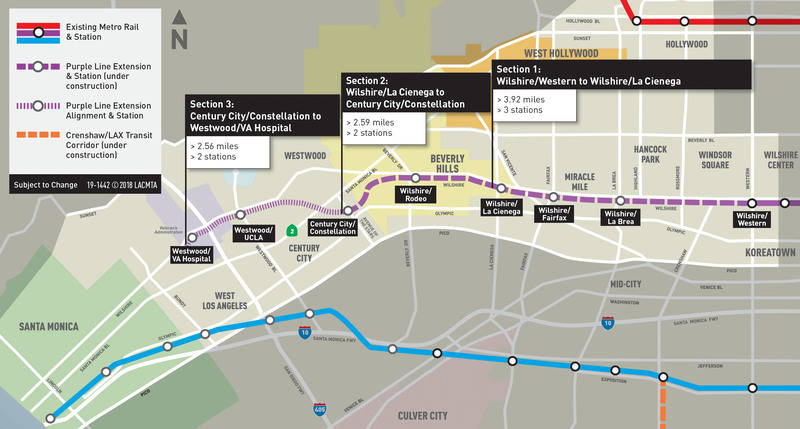 The Purple Line Extension will extend the subway nine miles from Wilshire/Western Station to Westwood, mostly under Wilshire Boulevard. The project is being built in three sections with this video focusing on the first section between Wilshire/Western and Wilshire/La Cienega. To make this video, Metro worked with Heritage Tree Films, which is based in the Crenshaw Corridor. Paris McCoy, a Heritage Tree co-owner and cinematographer, is a native of our region and one of the few African-American women working as a cinematographer. Heritage Tree also collaborated with Metro to produce videos with 360-degree views. Those will be released at a later date. •When completed, the ride between downtown Los Angeles and Westwood is expected to take about 25 minutes. That, of course, is much faster than driving between DTLA and Westwood during peak hours — and many other times of the day or night. •The Westside is considered the second-largest job hub in our region behind downtown Los Angeles but has yet to be fully connected with the Metro Rail system. Once the extension opens, it will be easy to transfer between the subway and Metro’s light rail system in DTLA at 7th/Metro Station or Union Station. •The Purple Line should be fully open in time for the 2028 Summer Olympics and Paralympics to be held in the L.A. area. The subway will be helpful with the UCLA campus the site of the athlete’s village and some Olympic events at Pauley Pavilion. Section 1 is scheduled to open in 2023, Section 2 in 2025 and Section 3 in 2027. •The Purple Line will also one day have transfers to two future north-south rail lines: the Sepulveda Transit Corridor that will run between the San Fernando Valley and the Expo Line (and eventually to LAX) and the Crenshaw Northern Extension that will connect the Crenshaw/LAX Line to Hollywood. •The total cost of the project is about $9.4 billion. Sections 1 and 2 of the Purple Line Extension are funded by the Measure R sales tax approved by L.A. County voters in 2008 and a pair of large federal grants. Section 3 is being accelerated with funds from the Measure M sales approved in 2016 and a federal grant currently being finalized. •An associated project is expanding the Red/Purple Line subway yard in DTLA and making it quicker for the subway to turn around at the Union Station terminus. That, in turn, will allow more frequent service on the Red and Purple Line in the future. •A wealth of info on the Purple Line Extension and construction notices are posted on the project’s home page on metro.net. IMHO, I still think it is worthwhile to the extend to the purple line to downtown Santa Monica with the current momentum of rail construction, giving the rail network a sense of “completeness.” I realize the expo line already provides rail service to the west side but it serves the southern portion not the northern portion that the purple line extension to Santa Monica would provide.